If you have yet to meet Ronald Holden — food and wine writer (you can check out his stuff on his blog), Cornichon rablerouser and all around bon vivant — you should add it to your list of things to do. He’s forgotten more about the Seattle food scene than most anyone knew to begin with! 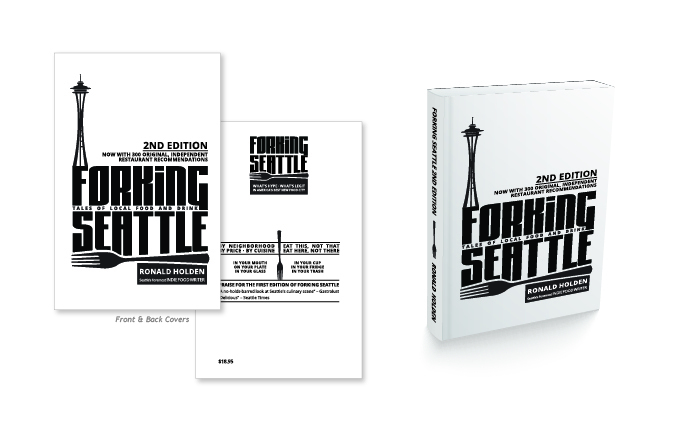 When Ronald decided to pen a tome about the Seattle food scene, he tapped us to design the book cover. And as soon as we hear the title Forking Seattle, we knew exactly what to do! Crisp and clean and designed to jump right off the shelf and into your cart for a little lazy day reading. Fork that!